I have a special treat for all of you. I hope those who have visited will come back for this new video from Tim Shelbourne, the creative genius behind The Artist Quarter. I am a big fan of Tim, the way he paints, and most of all his method of teaching. He approaches everything from a traditional artist standpoint, even though he has painted digitally for many years. I am a subscriber of The Artist Quarter and highly recommend it for everyone. Tim is at home with Photoshop as well as with Painter 12. He has a very unique way of cloning in Photoshop CS5 that I have not seen anywhere. 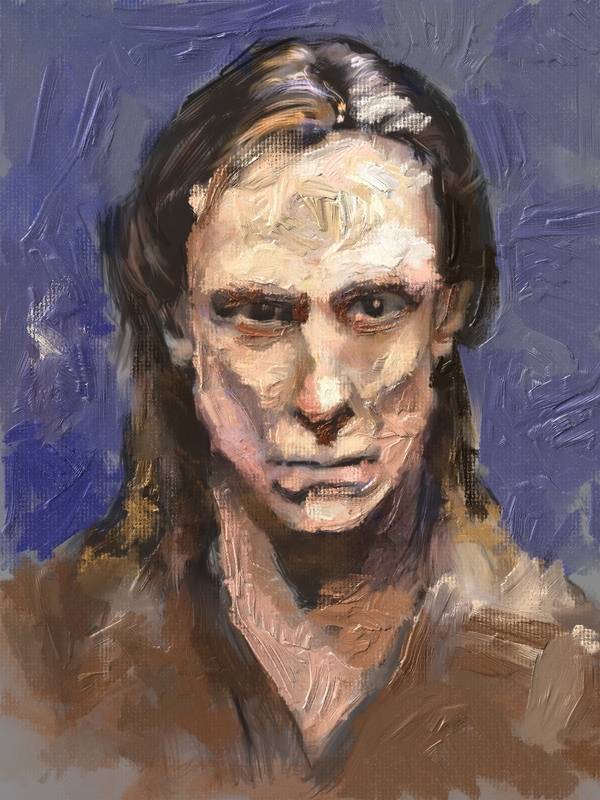 Check out his impasto sketch that he did with the Bristly Dabs in Painter 12. And then for a real treat, watch the video and see him talk about how he is using them. He is a bit gushy about the brushes; I turned red, but I can’t tell you how pleased I am that someone with his painting skills likes the new variants. And, he is going to show you some nice tricks with Painter 12. Tim, my friend, thank you so much for sending this video. Before I go to the image and video, I wanted to mention something that Tim is doing that is very unique. He is having online ateliers, French for workshop. I have attended several and they are fantastic. It is like having a workshop in person, but you don’t leave your house. The workshop last for several days or weeks. We have video materials, PDFs, and even special brushes to download. On the first day we meet via Go To Meeting and Tim gives a live demonstration and takes questions. Tim records the live demonstrations and makes them available for the attendees. Then we meet several more times for live demonstrations and a chance to show our work to other participants and get live critiques. I love these workshops. Visit The Artist Quarter, you will be glad that you did. Tim, I want to thank you again for doing this video. I think many folks will paint with these new variants thanks to your inspiration. I hope y’all enjoyed this special treat, if you did let us know. This entry was posted in Skip Allen & Painter 12 and tagged Bristly Dabs, Brush, Brush making, Corel Painter 12 Tutorial Video, Digital art, Impasto Panel in Painter 12, Painter 12 Tutorial, Skip Allen and Painter 12, Tim Shelbourne, Tim Shelbourne and Painter 12, Tim Shelbourne Painter 12 Video Tutorial. Bookmark the permalink. 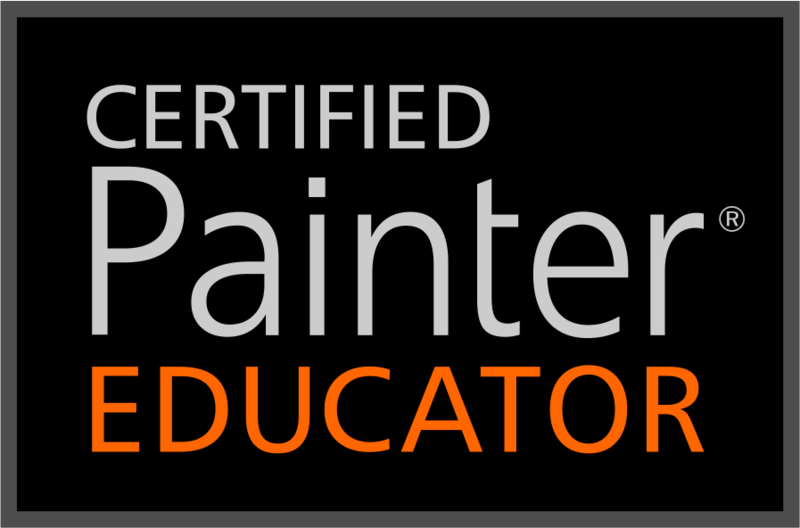 Bristly Dabs for Painter 12 and Backward Compatible to Painter IX. Thanks Dave! I think Tim is inspiring, too. And thanks for stopping by. I really enjoyed the video Tim and feel the same way about the brushes ! They work so much like the “real thing” !! Between this video and Skip’s 3 videos, one can really produce an effective painting and have loads of fun painting it !! Thanks again for sharing them Skip and sharing Tim’s video wtih us !! Hey, Kevin, you have a bit of the paint on your nose. You’re standing too close to the painting 🙂 but you look rather cute !! Skip is off doing other stuff. Want to come over to my and play? I like you and I bet we could cause all sorts of mischief. Oh gosh, here is comes…got to go. Thanks for the nice comment on the brushes, and you hit the nail on the head about Tim…he is as outragious as his video. I always learn something from him. You will do great with the brushes; I know you will. I can’t wait to see what you do. We are going to have fun in the brush class, provided I can get the thing finished…did I say that…don’t tell anyone. Thanks again for coming by and commenting. That was a mesmerizing video of Tim’s. Makes me really want to try your Impasto brushes! And he is absolutely right when he gives you high kudo’s for designing great brushes – you’re the best and the most generous! I agree; I am mesmerized by all of Tim’s videos. I would love to see you try your hand at impasto. I can’t believe I got so distracted away from watercolor doing them. Thanks for the nice comment about designing brushes. You are a good friend. The brushes are very pressure sensitive. The way I have them set, may not be the best for you. Also, I realized this morning, that when David made them backward compatible for earlier versions, any special brush calibration in 12 would be strip away. So, you may need to play with brush calibration with each brush to find the right sensitivity for the way you paint. awesome….was watching at work and someone walking by asked was that a real painting?..the brushes are very effective and “life-like”,if that’s a good choice of words..i was never a user of impasto, but my mind is buzzing with things i want to try!..thanks again for giving Skip.. Thanks for commenting. I hope you don’t get in trouble at work. I like life-like as a description. Can’t wait to see what you do with the brushes. Tim is the best. I’m glad you liked his video. Do check out The Artist Quarter; we have a blast there. Hi Kevin !! Whatcha up to ?? Tell Skip I’m still playing with the brushes and I’m waiting for the class to start…and I’ll post a couple of them there !! You be good now !! 🙂 I’ll come over soon and we’ll think of something to make Skip’s head explode !!! I have hidden this message from Skip for several days. I don’t think he will notice my answer. We have to be careful; he can’t actually confine me, but he could block you from coming over, and I am so looking forward to our play date. Exploding head sounds fabulous. Hugs, Kevin your favorite good virus. What?!!! What the heck is going on here? Judi, you are encouraging that little monster. OMGosh, I need a nap. Maybe everything will be OK when I wake. Wow very nice presentation, Tim! And wonderful brush work Skip! We so appreciate all the time and effort you make , in order to create such masterful brush tools! Thanks for stopping by and making a comment. I just took a few minutes and checked out your gallery at your site. Wow and double Wow. Mighty nice work! This is indeed helpful to see how Tim used the brushes. Also the HiRes copy of the painting lets a person zoom the size and see the varied effects. Not having a painting background I immediately afterward searched YouTube and watched a few examples of impasto painting and glazing. I am actually planing to do something quite different but with the same brushes. Nothing original, but new capability for myself. Between the maturity of the program, the speed of modern desktop PCs and the refinement of the tools by enthusiastic artist like Skip. The beginner has more juice to get something done that is pleasing in a much shorter time. Even seven years ago it wasn’t painting when I tried, it was only watching single strokes chug along behind me. Skip, I have been going back over these older videos. Thanks so much for keeping them as I am learning a lot. Unfortunately I’m using Painter 12 with the latest updates and my adjust lighting menu doesn’t look like Tim’s. Am I missing something or has it changed since then? Dumb me . Is my face red. I wasn’t looking under canvas! Can you tell I don’t know much about Painter? I’m getting there slowly, but surely thanks to people like you my friend!